Polyurethane concrete raising and mudjacking are two methods used to raise and support sunken or unstable concrete slabs, by drilling holes and pumping material under the concrete slab. » See polyurethane concrete raising in action! Our polyurethane foam method uses the concrete slab itself as a means of delivering poly foams that raise concrete, fill voids, and stabilize soils. 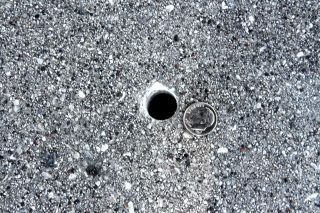 A ⅝” hole is drilled through the slab into the subgrade. A tapered delivery port is installed into the ⅝” hole. The injection gun is connected to the port. 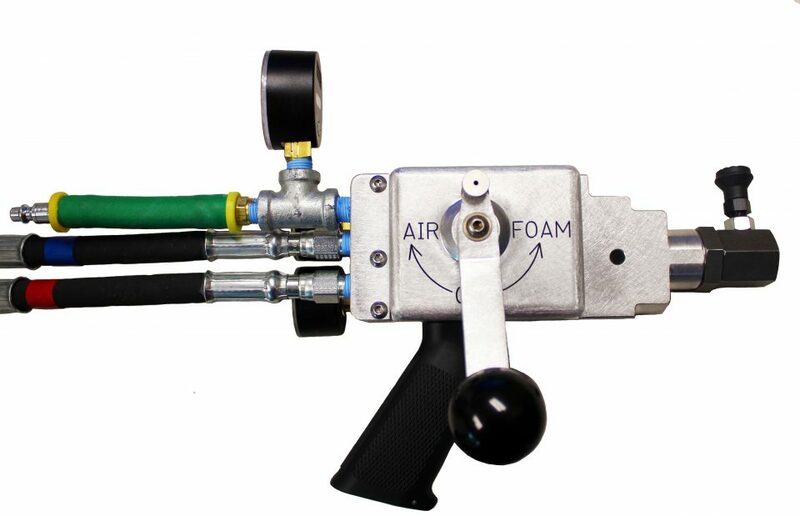 The injection gun delivers the polyurethane material through the port and slab. Expansion of the material occurs within seconds, compressing loose soils and raising concrete. Raising concrete with polyurethane foam is done with incremental injections. Lifting foam will fully expand within 10-15 seconds allowing you to monitor the raising and preventing over raising the slab. We suggest using an air-purged gun to deliver foam under the slab. This equipment will keep the injection port open between injections, allowing the foam to fully expand before injecting more foam material. HMI dedicated years into designing this concrete lifting injection equipment specifically for concrete lifting. Valve Operated with one-way check valves. Air Pressure Gauges -Identify plugged ports before you pump! Void Filling: Concrete settling is not the only issue our foams can solve. Voids under slabs are often present in areas where wash out or excessive settling have occurred. This material will weigh on average 15-25 times less than a traditional mudjacking or cementitious grout mix, applying less stress on an already failed subgrade. The process for void filling is the same as concrete raising: drilling, port installation, and injecting the material. All dual component polyurethane foams create heat when installed. Void fills must be done in a layering method to allow heat to dissipate safely. We will issue a Stewardship manual to all dual component polyurethane customers. This manual covers safety precautions that must be observed when injecting dual component polyurethane foams. Joint/Slab Stabilization: Slab stabilization is often required when slabs lack support, but may or may not be settled. Slabs can crack when loads exceeding its capacity are applied. Slab/joint stabilization applications require the voids to be filled to eliminate movement and offer support. This type of foam is specifically designed for joint/slab stabilization applications due to its very long reaction time and minimal expansion strength. It will take longer to expand, allowing for better coverage under the slab or down a joint. When compared to concrete replacement, the process of raising concrete with HMI’s polyurethane foam is inexpensive. It is also exponentially faster than replacing concrete. Repaired areas are ready within minutes to be utilized, as they were intended. Polyurethane’s ease of material process and clean-up are some distinct advantages over traditional mudjacking with grout. Are you looking for the best polyurethane materials on the market?